Visiting the Magnolia Plantation (see this post) has me very intrigued with the slave culture of the South. While we were there, I asked the tour guide what kept the slaves from escaping. She said it was the family culture. 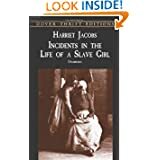 Occasionally, one of the girls would be sent away if a man on the plantation took an “unnatural interest” (the term she used) in her, but the family knew they would likely never see her again if they did send her away, so they were very reluctant to do so. The different families lived together, cooked together, helped each other raise their children, tended house together and of course, sang and worshipped together. I didn’t have enough time on the tour to chat with the guide about all she had learned about this particular plantation’s slaves, but she did recommend this book for a firsthand account of slavery. It was free on Kindle and very affordable in paperback. I highly recommend it. My kids will be reading this as part of their history education (not quite yet, though, as there are some parts they aren’t quite ready for). Within the first few paragraphs, I was struck with the quality of this woman’s writing—both her vocabulary and her style. And by the end I was completely captured by her strength, faith, determination and love for her family and God. Quite an amazing story–heart-wrenching and inspiring at the same time. Read it if you have the chance.